The Warrior’s Mark West homes for sale could more appropriately be called Much Higher Warrior’s Mark. On a steep ridge above the lower version, this subdivision was created in 1977, ten years after the first homes were build down by the Blue River in Warrior’s Mark. Warriors Mark West homes for sale have been built out slowly ever since. Less than 6 percent of the lots remain vacant. 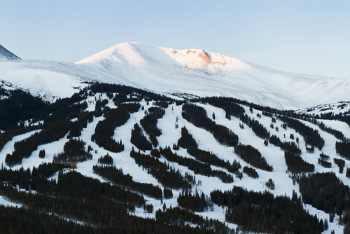 It is common for people to ski in and out of Warrior’s Mark West, but it is not for beginners. 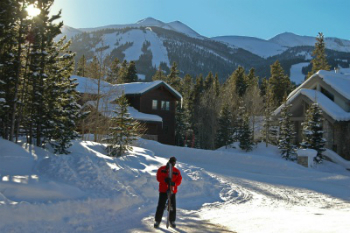 Crosscountry skiing and snowshoeing are other winter activities easily enjoyed from Warrior’s Mark West. And hikers and bikers can use the same trails in the summer. Browse the available Warriors Mark West real estate listings below or learn more about this beautiful subdivision. These subdivisions were named for the Warrior’s Mark mine, which was one of the largest gold mines in the area in the 1880s. The mine was located high up Indiana Creek on the east side of the Blue River Valley, near the abandoned town of Dyersviille. Warrior’s Mark West homes are located on the west side of the river, but high enough to be able to see across the valley to its namesake on Baldy Mountain. To the west of Warrior’s Mark West, the land drops off steeply into Lehman Gulch. The Burro trail starts out from Beaver Run along this gulch, which is also the bottom of the ski run called Lehman. Ski and hiking trails extend from this subdivision down to the Burro Trail and the ski run, but they are steep. By the same token, the view to Peak 10 and the Tenmile Range are unobstructed. Warrior’s Mark West is an in-town subdivision, but has yet to be included on the town bus system. A flume trail from the neighborhood and the Burro Trail is still one of the best ways into town, and certainly into the national forest. Number of Units: 74 total: 22 duplex/triplex homes, 48 single-family homes, 4 vacant lots. Vacant: 4 (one is 8 acres and the other three about 1/3 acre). Size: 2020 sq. ft to 4875 sq. ft. Amenities: great views, large lots, near bus routes, in town, walk to slopes, trails nearby, community open space, fishing on the Blue. 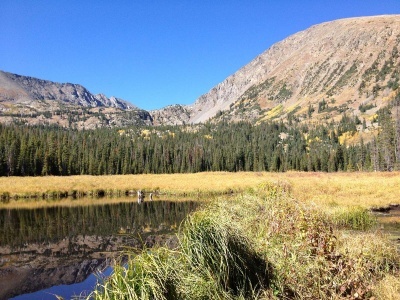 Warrior’s Mark West is located one mile from the intersection of Boreas Pass Road and Highway 9, in the southern corner of the town of Breckenridge, on White Cloud Drive above the Warrior’s Mark subdivision. Driving south on Main Street through Breckenridge turn west (right) on Broken Lance Drive, turn left to stay on Broken Lance and continue .7 mile to White Cloud Drive. Along this drive, or on the roads off it, you’ll find the homes of Warrior’s Mark West. Do you have any questions about Warriors Mark West? We would love to tell you more about it! Contact us now.